Still, the location is significant- We all know California’s climate is friendly to sheet metal, but the UV energy here does no favors to vehicle finishes. This Nova shows the impact of our California sun in the faded black-out paint around the window frames, as well as the disintegrating red and blue body striping. This picture of the wheel center caps also shows the effects of UV radiation. The cap pictured on the right was the only one left still displaying it’s red and blue background. But enough of the California climate- Let’s look at the features of this 1974 Nova. 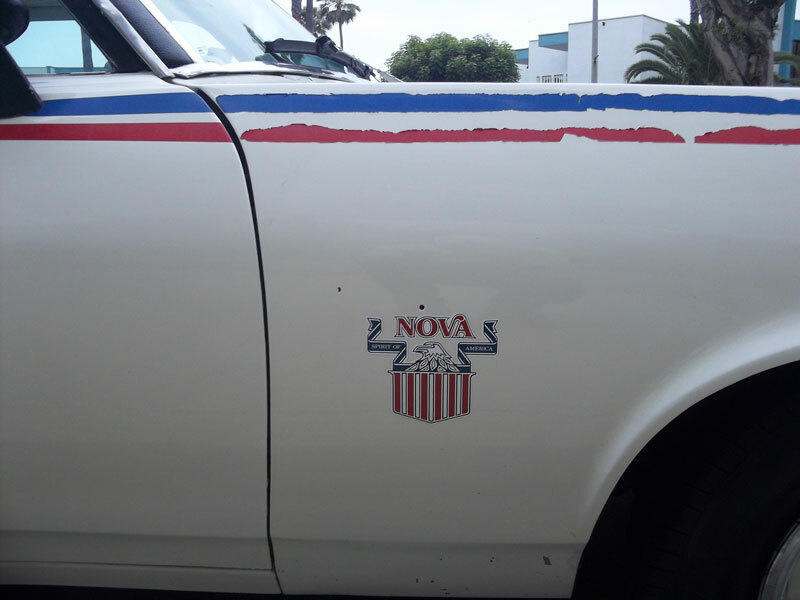 The internet tells me that in 1974 the “Spirit of America” trim package was offered on the Vega, Nova, and Impala. You can also find a few images of El Caminos with this package, but there is an online debate regarding the authenticity of Spirit of America Camino. Some feel any El Caminos so offered were modified at the dealerships, rather than factory built models. 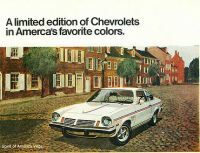 This internal Chevrolet sales info brochure for Spirit of America models does not show an El Camino version, so I lean towards dealer built. In the case of the Nova, the package was based on the 2 door hatchback (which had been introduced the year before). The exterior changes included subtle red and blue stripes on the sides, roof, hood and trunk. With tasteful Spirit of America shields adorning the fenders and trunk lid. The grille and window frames included black out paint, and vinyl covered the front of the roof. For unknown reasons, Chevy designers avoided using red or blue on the roof (and exterior mirrors), instead choosing black as a third accent color. 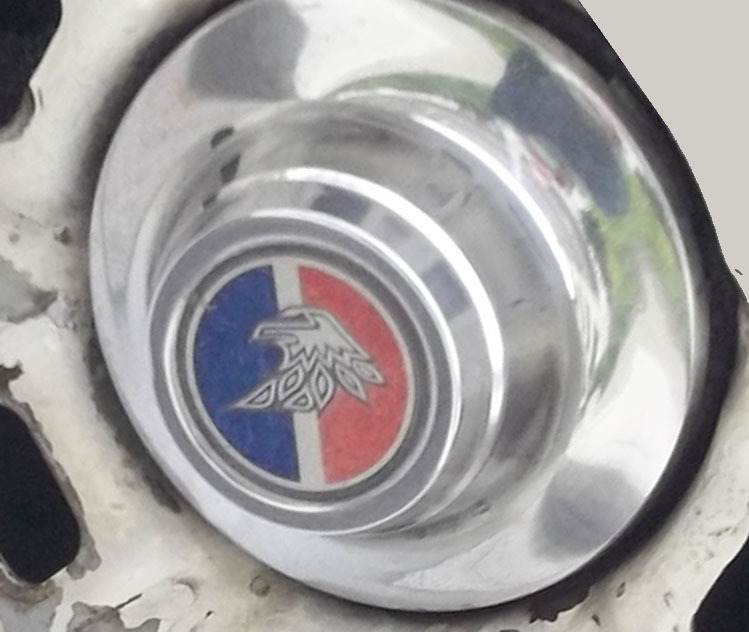 Finally, the package added styled steel wheels with an eagle’s head displayed in each center cap. 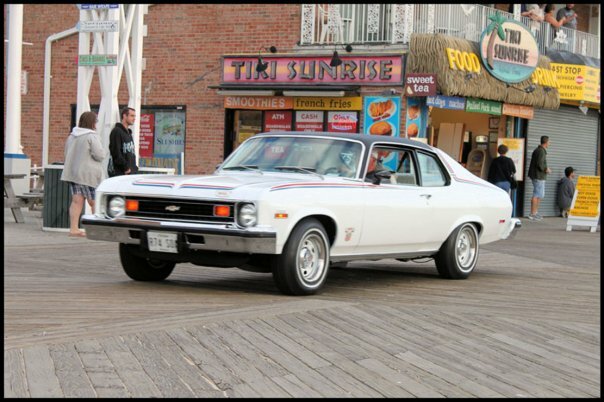 That year, Chevy sold 14,463 Novas with the Spirit of America trim, representing 3.7 % of 1974 Nova production, but a healthy 18% of all Nova hatchbacks. 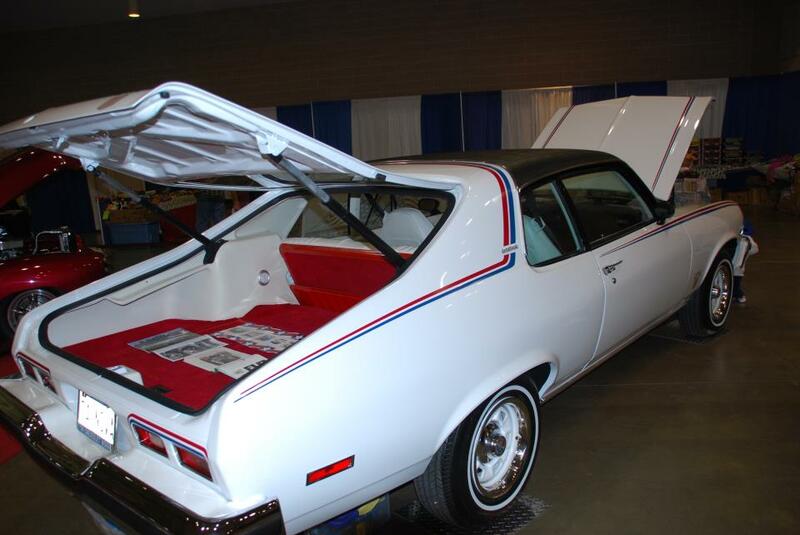 Inside, the Spirit of America Nova included white seats and interior panels, red carpet and seatbelts, and a black instrument panel. The package also added red, white, and blue accents on the horn pad and door panels. A look at our interior reveals a couple of interesting things. 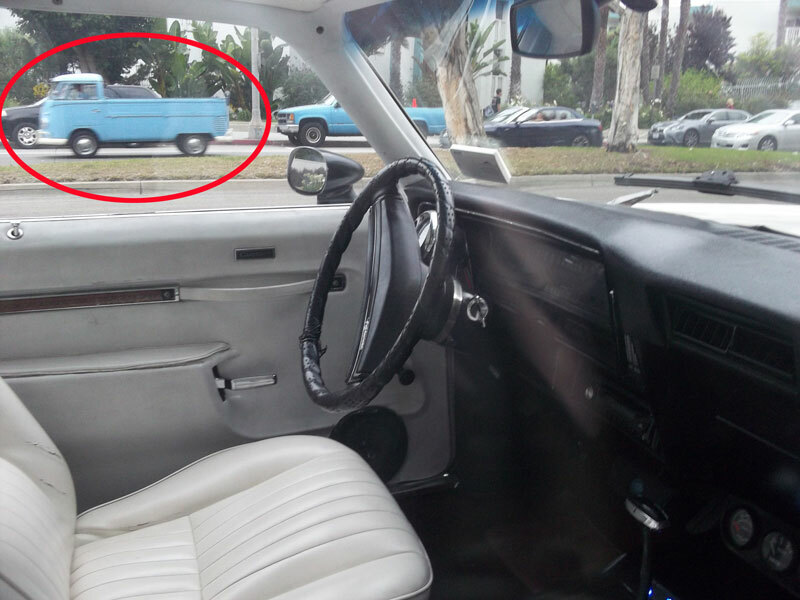 First off, a look through the driver’s window reveals another Curbside Classic headed south on Catalina Avenue. Some may get excited at such sightings, but for me it’s just another day in Redondo Beach. More importantly, notice that this interior is missing the red carpet and the unique three color trim pieces on the door panel and horn pad. While this shot does not show it, the seatbelt webbing is also black, not red. Hmmm, it could be that we’re looking at a phony Spirit of America! A closer look also reveals that two exterior panels include mounting holes for normal Nova badging, further evidence that the car may not be all that it seems. 1) The exterior parts are all complete, and appear to be original. The black out paint, black exterior mirrors and black vinyl roof all match the spec sheet. 2) Carpets wear out, and trim gets damaged. The dash and seats are the right color combinations, and the door panel reads “Custom,” correct for the Spirit of America package. 3) Spirit of America Novas are worth about 15% more than a Nova Custom, so cloning a Spirit of America hardly seems worth the effort. You have my permission to argue clone versus fake all day. I’m leaning towards the real thing, if only because this car is a hatchback. Almost 20% of ’74 hatches came with the Spirit of America package, so if you find a ’74 hatch it’s often decked out in red, white, black and blue. Maybe a few panels have been replaced or repaired on this car, but I think it rolled out of the factory as a fully dressed Spirit of America. Before finishing up, I should also note that both Ford and Chrysler offered Red, White, and Blue trim packages around the same time. 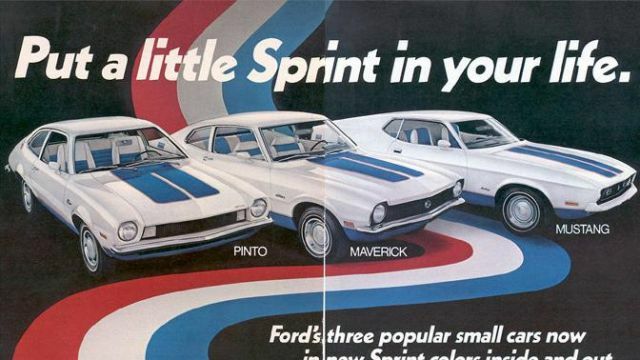 Ford offered the Sprint Package for the Pinto, Maverick and Mustang in 1972. Celebrating the 1972 Munich Olympics, the cars came decorated with red and blue shields on their quarter panels, emblazoned with “USA”. 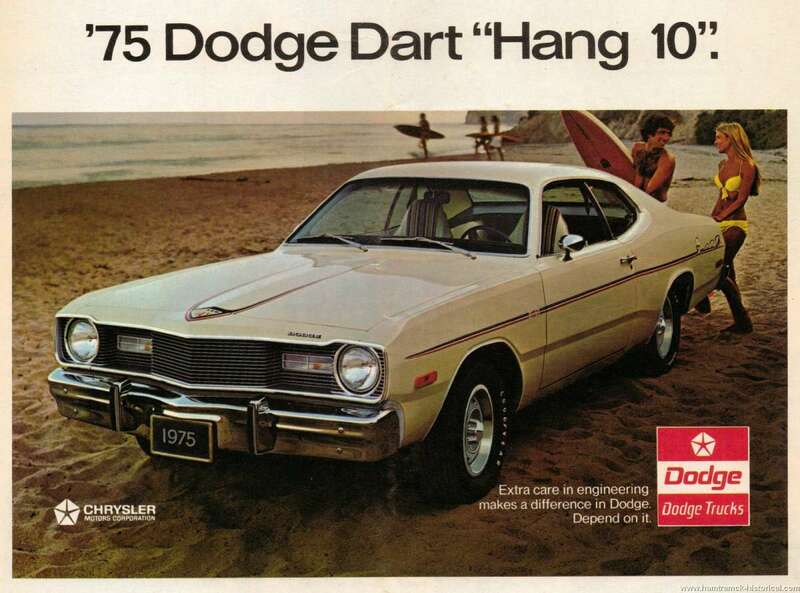 Two years later, Dodge offered this “Hang 10” package on the 1974 and ’75 Dart. Also using white body paint with red and blue graphics, it celebrated the California Surf scene, rather than US pride. 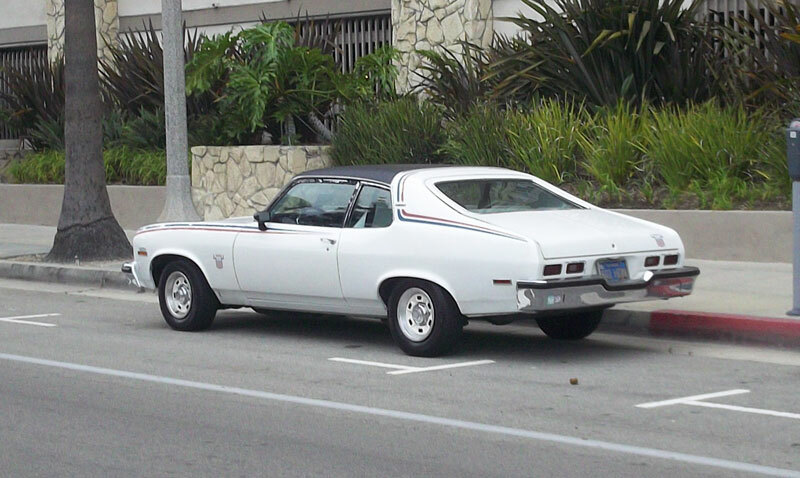 I’ve seen a Hang 10 Dart in the flesh, but it was at a Colorado Dodge dealer back in 1975, rather than on the streets of Redondo Beach. Looking back in time, selling a surfing car in Northglenn, Colorado seems somewhat ironic. But maybe not as ironic as selling a Spirit of America Nova in California. Given the wordly sophistication and imported car tastes of the California native, the cheesy “I love America” message, combined with the blatant “Buy American” vibe seems more appropriate for Detroit or Des Moine. Still, the blue and goldenrod plates establish the car’s California credentials. Six digit blue plates were issued up until 1980, so the car has been in state for at least 33 years. 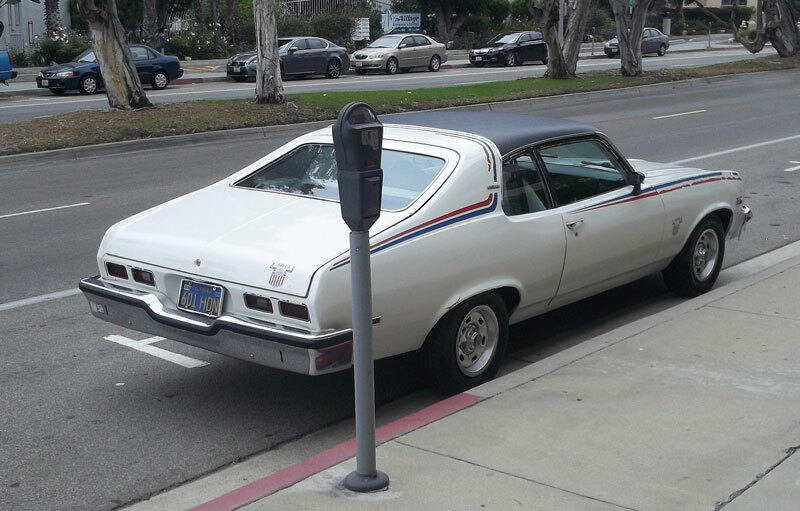 However, this patriotic Nova is packed with one thing Californians always go for- The biggest engine available! Well, that’s all I have for the Spirit of America Nova. While you enjoy it’s patriotic bunting, I’m headed out to search for that Hang 10 Dart. I had a neighbor with the Spirit of America Mustang and used to see it every morning on my walk to elementary school. Is that bondo on the rt rr fender lip? As to the open holes in the sheet metal, some how it just seems like GM to me that rather than running a special lot of stamping s without the holes, somebody got the smart idea to develop a special filler to fill in the badging holes and it disintegrated over the years; the partially filled fender hole would seem to support this theory. Okay….Adding, or removing, a hole during a press run is a simple process. The press shuts down for 5 mins. Tne resident Tool and Die man simply removes or adds the hole punch to the one of the dies. The trick is to make sure you keep them separated. End the end of the model run used to be a nightmare. Too much material? It used to get shuffled around for about a year,then get sent to parts and service. Not enough stock? Unles it was something crucial like a transmission. The car went to reject. Where it sat until stock was available. ” Just In Time” came into play in the early nineties. After about a year of growing pains. J.I.T wiped out a lot of “empty bins” and overstock problems. This is a most interesting vehicle. 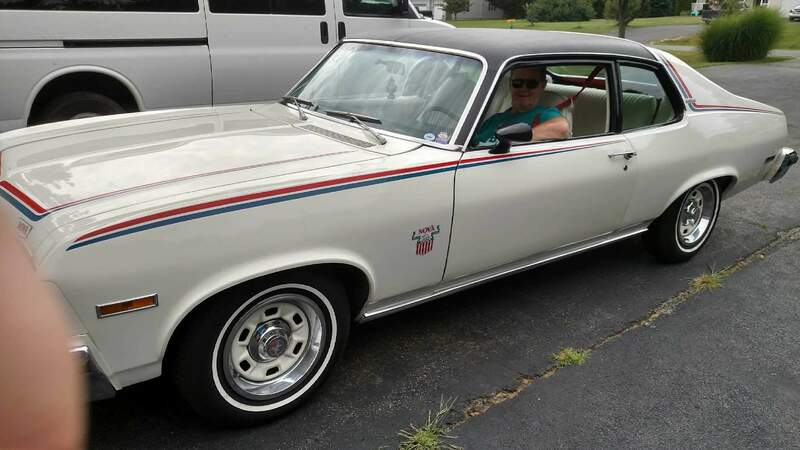 I bought the oldest son of mine a nova white red blue spirit he got drunk parked it on the railroad tracks end of that car agency iowa he lived with his mom way to go B. D. L.
Sorry, as a child I never saw one of these in the late 70’s/early 80’s in Des MoineS. You correctly note the California climate is much more conducive to celebrating this period of Americana now than in the majority of the Midwest, and vehicles trimmed like this one have long since disappeared from the typical Des MoineS street scene and culture of those interested in engaging in current fads of vehicle art and customizing. Factory pin striping on any surviving or restored iron is the best add-on vintage feature you’ll likely see here. 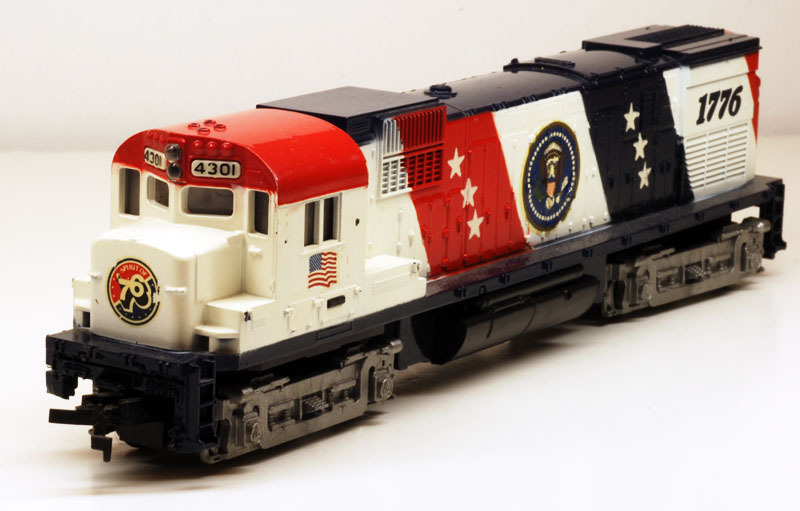 Any local enthusiast under 40 here would probably be inspired by seeing one of these in the rolling museum of your state, however. BTW, the Beretta behind it in the photo is also largely extinct in the Midwest. I just realized that about the Beretta—they have almost completely dropped off the street in Chicago, despite their near-ubiquity in the nineties. That I didn’t notice this until someone pointed it out says…something…about the car. Very coincident you should bring this up, as I just noticed this the other day. The Beretta’s headlights were bigger, but they extended further up into the hood. Such a small difference, but I think it looked much better than the Corsica. Corsicas have pretty much dropped off the face of the earth though. Yeah, its a Corsica, you can see the B-pillar, the Beretta grille extended down into the bumper more. Like I said, my folks had one of each. Dad’s was even a GT with the V-6 and Getrag 5 speed manual. He like it quite a bit (put 80,000 miles on it), but I thought it drove and shifted like a truck. Quick check for Beretta/Corsica. The Beretta had a divided park/turn signal lights in the bumper that were about twice as big as the Corsica was. Neat car. It’s nice to see a ’73-’74 Nova not hot-rodded out. Someone needs to pistol-whip the person who cannoned the rare custom door panels for aftermarket speakers though. Survival of these cars is low, especially the hatchbacks: probably due to their tendency to rust around the taillight panel & hatch area. I’ve never seen those center caps with any coloration before: thanks for posting a close-up of the intact one. I looked it up, and Hatchbacks made up less than 5% of 1974 Nova production, so they’re rare even without a rust issue. Now I’m wondering what the premium was to buy one. It seems like a nice upgrade to the overall package, so why so rare? I kind of wonder that it has to do with the lousy space utilization of this body style. The rear cargo floor seemed to be a bit high from my memories… From my perspective, a Citation hatchback probably had more cu.ft. of storage. My husband and I purchased a 1974 Nova with a Spirit of America package new from the dealership in 1974 and paid $5008 for the car. It has factory installed air conditioning. We still have it! I finished high school in 1973. My dad help me buy a new Chevy Nova Sprit of America. Mine was a three speed with a six cylinder motor. I had a lot of parties in the back of my car. I wish I still have the car. As a child I remember accompanying an uncle on a late night excursion to a Chevy dealer to look at cars without interference from the salesmen. This must have been late 1974, because one of the cars he was considering was the Spirit of America Vega and we gave it a good lookover on the brightly lit lot. The special edition made an impression on me, it’s the only vehicle I recall from that excursion. He eventually bought a 75 Monza, it was silver and also had some sort of decal package on it though it wasn’t America-themed but more of a sport-edition thing. My favorite time to look at cars, even in todays “homeland security” era, its amazing the number of car dealerships that are still mostly abandoned at night. Put there is a serene peace about a quiet, well lit car lot at night. I can remember these. I guess Chevy decided to try to pump up the volume on the slower moving units in anticipation of the Bicentennial. Guess that is why the Malibu and Camaro were not offered with the package, Probably this package also appealed to an older customer base also, which the Malibu and Camaro I would guess attracted customers more in their 30s. I remember thinking the Impala was particularly sharp looking at the time. Have not seen any of these in years, I think the Impala probably had the highest survival rate here in the Deep South. I suspect that the Spirit of America cars were the ones that Chevy needed help moving. Chevelles, Montes, Camaros and Corvettes were probably all moving fairly well even in recession-plagued 1974 America. Impalas were probably moving slowly, Vega was having its reputation catching up with it, and the Nova hatchback was not really that popular, as I recall. I do remember some of these out and about back then. My guess on the panels with holes is that there may have been a collision repair somewhere along the way. If Chevy built special panels without holes, those surely would have been hard to find later. Also, I bet a dealer really eager to make a sale could have swapped out the red trim pieces for black if a customer really didn’t want the car with red carpet and seatbelts. Regarding dealer activity on oddball color combos, my triple black ’73 Grand Prix had one previous owner and was pretty well taken care of. What floored me (no pun intended) was finding “red carpet” on the shards-o-build sheet I picked from under the front bucket seat. Evidently the original owner did not like the red carpet/black interior combo and had the carpet replaced with black. Too bad. I think I’ve seen both this car AND the VW Transporter in the background before. Ruby’s Diner in King Harbor, at the backside of the pier, has it Friday night cruise-in during the summer months, and I think I’ve spotted both those vehicles there before. Not only that, but years ago I used to be a mechanic at the now-defunct Champion Chevrolet in nearby Manhattan Beach. When going to lunch or heading to or from work, I think I may have seen that Nova skulking around the area. name and it hit my interest button. I owned a 1967 and a 1969 Cougar from new in that era.Especially interested in finding out a history fact on the ’69 engine options and what mine had. I’m thinking a singular/plural argument between “A Limited Edition” and “Chevrolets”. I would go with “A Limited Edition Collection of Chevrolets”. On a patriotic-themed special edition, this is most ironic! Ediots! The “Facts For Salesman” sheet states that the SOA Impala was available in dark blue, which is interesting since I thought all three models came only in white with red and blue striping. Wow, that’s interesting. The ’74 Impala SOA is a very good looking car. I wonder if the interiors and Rally Wheels* remained white on those. The first letter H makes me suspect that the plates were first issued in late 1974 or in 1975, based on plates I have in my collection, thus they’re probably the original plates from new. I respectfully disagree. I think this car is a “clone” precisely because of the plate, which I think was issued sometime in spring 1973. License plates starting with “G” were issued from fall ’72 to early ’73; “H” plates were all out by June, and “J” plates were out in significant number before the 1974 model year. To me, this car is a 1973 made to look like a “Spirit” car. I was 20 in 1973, and I knew several people with new cars then. It was a great year for auto sales. Between that and the very suspicious fender holes, I vote CLONE. The seat belts are the ’74 style closed-loop inertia reel type, minus the the flimsy plastic guide loops on the side of the seat, that likely snapped off sometime in the Ford Administration. I highly doubt these were retrofitted. It’s possible that this is a very early release SoA Nova where all the holes, red carpeting/seatbelts, and other idiosyncrasies necessary for that specific model hadn’t yet made it to production. I can’t really feature a dealership going to all the trouble to convert a non-SoA Nova. In addition to the decals, there’s the white interior, black vinyl half-top, and black rearview mirrors. Did the driver’s side have the fender holes, too? If not, then I’d go with the idea that it’s a collision repair where the body shop either couldn’t get the correct fender/hood of a low production package, or simply used non-SoA parts. As to the missing red interior pieces, I’d chalk that one up to being late in the model run when some of the red pieces just came up short. Missing just one of the pieces would result in an obvious mis-match, so GM just began using standard Nova pieces for everything in the interior. In fact, it wouldn’t surprise to learn that the red pieces only existed in the literature, and none of the production cars had any of that stuff, at all. Hmmm, did I say in your face? Maybe I just meant gross. We are the original owners of a 1974 Spirit of America Nova. Ours has red carpeting on the floors and in the hatchback area. The car came with black seat belts from the factory. A friend purchased a new one @ the same time as we did, and his had red seatbelts. We owned a 74 Nova SOA in the late 70’s, but had to sell it due to an overseas service requirement. I recently picked up another one with both red carpet and seat belts. Has been my observation that SOAs that are branded with 350 over the front markers have black seat belts, this without have red belts. Perhaps the production plant controlled this. My current SOA was built in Kansas City. Didn’t California allow people to keep and reuse their old license plates? (I have no idea if they still do.) If so, it’s possible that the plates don’t necessarily correspond to when the car was new. For instance, maybe Original Owner bought a different car a year or so earlier, got into an accident and had the car totaled by the insurance company, and then used the settlement to buy this, recycling the previous plates. California carries plates forward at the time of sale, unless the new owner wants to update to a current plate (because the old plates were faded, they wanted new personalized plates, or just preferred the new color scheme). But plates cannot change from car to car, UNLESS the car’s model year matches the years that California offered black plates. If so, Cali offers a Year Of Manufacture (YOM) program which allows an owner to scare up an existing set of black and gold plates, and put them on a car which matches the correct date range. Some classic car enthusiasts don’t like the program, because it allows folks to bring in out of state cars, and represent them as California born and bred. The program does NOT apply to blue and gold plates, so the ones on this 1974 date have been on it since the days of blue plates. Sacramento just passed a law that may open things up across the board. If enough folks sign up, three classic plate color combinations will be available for any car. However, the plates will use reflective paint, offer seven digits, and probably will use screen printing for the “California” script, rather than embossing the state name into the sheet metal. So people will still be able to tell the blue plates on my car are original, rather than a new issue of the old plate colors. Some “H” through some “L’s” were issued from September ’73 through the fall of 1974 in California. This one obviously wears the plates that were issued to it as a new car, probably sometime in the early fall of 1973 . . . . In California, Oregon, Washington, Alaska and Hawaii, the plates stay with the car. For example: If you have, let’s say, a ’63 car, the plates originally issued with that car can stay on that car. You aren’t mandated to get new plates unless the old/current ones are damaged, unreadable, etc. At least in California/Oregon and I believe Washington State. Hawaii allows only the current “rainbow” plates issued in 1993 . . . 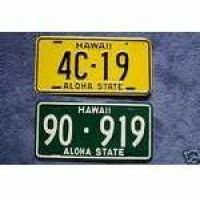 I love the old Hawaii Plates . . . . Green/white were the first that said “Aloha State” (1961-68); Yellows 1969-75. Really nice find. I remember these. But I’d forgotten that they were liftbacks. Heck, I even forgot that liftback Novas were ever made! There was a liftback X-car available for all the divisions, and it was a slow seller at all of them, but they kept offering it for years, it continued on the 1975 and up redesigned X-cars too, they were interesting, they had a fold down rear seat and under the floor storage compartment too. IINM, the hatchbacks first appeared in 1973. When I was a kid, my parents had a ’73 Pontiac Ventura hatchback. They bought it new in the fall of 1972 and owned it until late 1978. It was dark brown and had a 350 in it. I remember that we would always look at other 2-door Venturas we saw to see if they were hatchbacks, and they hardly ever were. 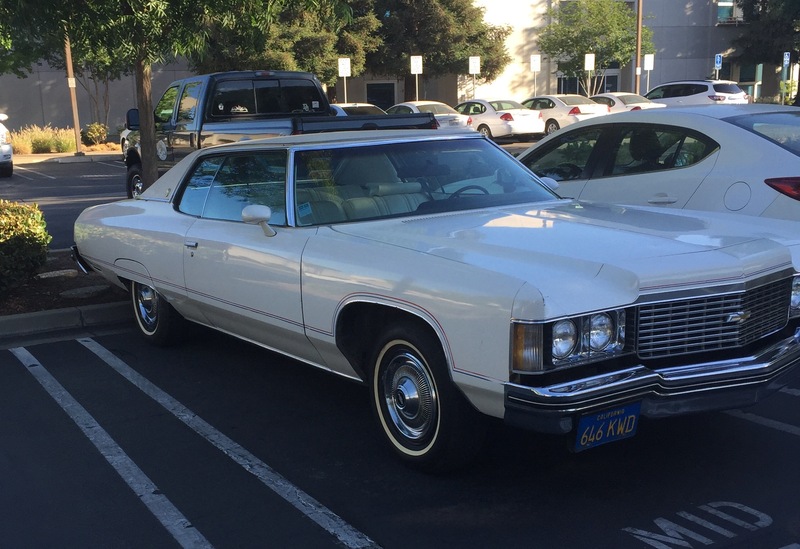 Several years after they sold the Ventura, around 1984, we spotted it in a supermarket parking lot. It initially caught our eye because we noticed a dark brown first-generation Ventura hatchback, and there simply couldn’t have been too many like that on the road at that point (this was in Massachusetts). We were able to use other clues to identify it as being definitely the same car they had once owned. IIRC, X-body hatchback production was far higher in 1973 than in any other model year. Either there was an initial burst of sales due to novelty, or GM overproduced them that first year, then realized they weren’t selling, and cut back. I believe that the hatchback continued all the way to the end of RWD X-body production in 1979, but towards the end some variations were produced only in very small numbers. What a shock to see this morning! I owned a 1974 Spirit of America Nova from ’83 to ’87. Not because of any patriotic fervor, just a sudden desire for some Detroit iron around me every day. I’d been driving a ’65 VW bug, and got T-boned coming home from work on the TV Highway in Beaverton by an old man in a Datsun coming out of the Safeway parking lot. Somebody had stuck some damned flyer under his windshield wiper which he didn’t see until he was pulling out of the parking lot. He reached around to get it and his foot slipped off the brake onto the gas. So he was going maybe 10 when he hit me. But it pushed me a lane over and that VW folded up like a paper cup. The baby seat strapped in next to me got filled with shattered glass. Thank heavens it was otherwise empty. That shook me up pretty good and ended my desire for wispy little cars. I didn’t have a lot of money and my best friend, who was driving an E-Type at the time, offered me his old beater Nova for $700. It ran great, but it was rusty around the fender wells from having spent its first winter in Wisconsin. 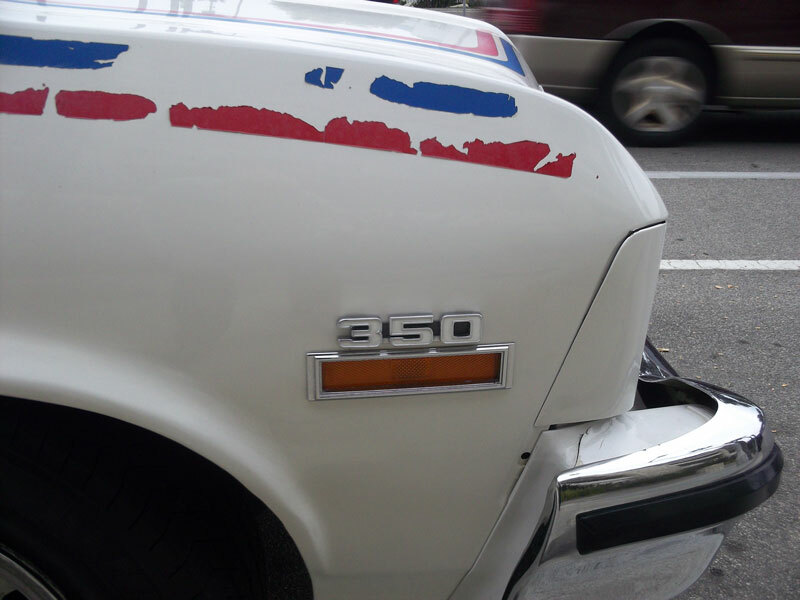 The striping and the paint were badly faded, and the vinyl was already peeling. By the time I traded it in, you had to lift that long door to get it to latch, and the headliner was falling all around. In true beater fashion I stuck it back up with an office stapler, which didn’t work very well. The massive hatchback opened up a huge cargo space. Its mile-long weatherstrip leaked pretty bad. Mine didn’t have a radio, so I stuck a plastic Radio Shack AM/FM on the floor between the seats. No floor shifter like this car, mine had a column shift. No little holes near the trim either. This car looks exactly like mine must have looked in Wisconsin, but those little holes and the floor shift with no console don’t look right. Given how badly my Nova’s paint was faded after less than ten years in the Oregon sunshine, either this car spent 40 years in a garage or it’s been nicely repainted. Maybe with a little trim removed and a few decals added. Hey, why not have a little fun? It’s no crime. This Nova was my one and only American V8. Small block 350 with Turbo-Hydramatic, so strong, so smooth. In spite of its vague steering, weak brakes, silly handling and thirst for gas, what a sweet cruiser. I just loved that car. Spirit of America indeed. I know nothing about this car, but I have a soft spot for Bicentennial kitsch. I blame my cousin’s awesome Tyco “Spirit of ’76.” Not actually a very good model, as if I cared when I was 5. Can relate to your story very much. My first car was a 74 spirit Nova. Was 16 and bought used by my mother for my birthday in 78. Loved that car. Did install dual exhaust, new Firestone 70’s and Crager rims. Had an old 8 track my Grandfather gave to me along with house speakers I laid on the “floor” in back. Later upgraded to Pioneer SuperTuner and mounted Jenson speakers. Living in Michigan at the time, yes started to rust, especially in the back. Also had to put weight in the form of 6 – 50lb salt bags in the back as the traction was really poor in snow and ice. Just have great memories of football games, beer cruising and girls in the back (though not that roomy). It finally did pretty well rust out and traded it in 83 for another white 79 Nova (think I got about $300 for it). No comparison from a quick 350 V8 to 250 V6! Just wish I would have had the effort to keep it in good condition. It could be a survivor GM could be that slack with assembly I guess The stripe kit is similar to the commonwealth games cars that were decorated by GM here for 1974 games. Now that I live in the south, I think this is probably just about the ideal car for me. Maintenance guy at the apartments where I first lived in 1981 had one of these and it was probably the most functional car I ever saw for that type stuff. Cavernous rear. Think I would rather do with less than a 350. My own nova was a 68 manual with a 230. A hatch would have been good but the 350, not so much. I once rented a rwd toyota hatch that might have been the best of all. When I lived in virginia the rear hatch on my 78 olds starfire was a rust magnet and made a new place to leak on a daily basis. Might be a reason they aren’t so popular. I still think hatchbacks are great and I’m probably one of a handful that do. I spotted the hatch on the Nova before anything else. I had one hatch (83 accord) in a dangerous situation. Loaded with a batch of AC gear and drove it north from Conroe on I-45. It had been raining but stopped. The front wheels lost traction at freeway speed every time it hit a wet spot. Needless adventure in my opinion. The nova would have been a lot better there. Rwd is a better answer in such a situation but sadly not very available. Anyone who was around back then recalls just how saturated everything was with 1976 getting near. While I thought Chevrolet offered the nicest-looking (yeah, I know, I’m biased toward Chevy and I admit it) vehicles in the patriotic theme, during those years, all of that stuff got old real quick and I would never buy a car decked out like that. If I had a real job in those days, a Nova is most likely the car I would have bought. 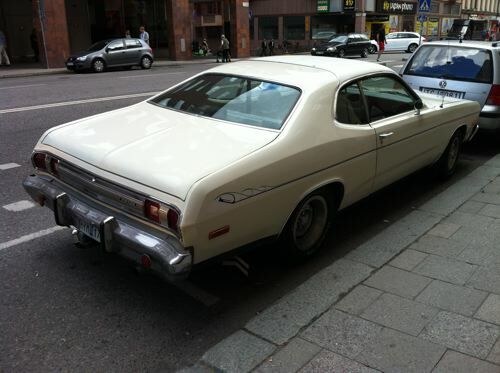 However, I was still in school and drove a very nice 1972 Nova. There was definitely a California thing going on. 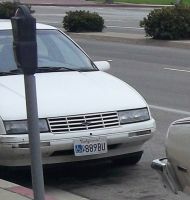 Besides the Chrysler Hang 10 there was the new Chevy Laguna and Pinto Cruising Wagon. Even VW got into the act with the Sun Bug, remember that? It wasn’t even a convertible, although you could get a convertible version. Great find Dave. Always loved that generation. Looked good and was good, that’s a Cadillac Seville underneath. This sure is a neat vehicle, I love the patina and classic license plates. The Corsica also caught my eye because they have become rarer over the years. The matching Electric Blue Chevy sure looks nice and those Chevy/GMC trucks are all over the place, even the Dodges seem more common than Fords. 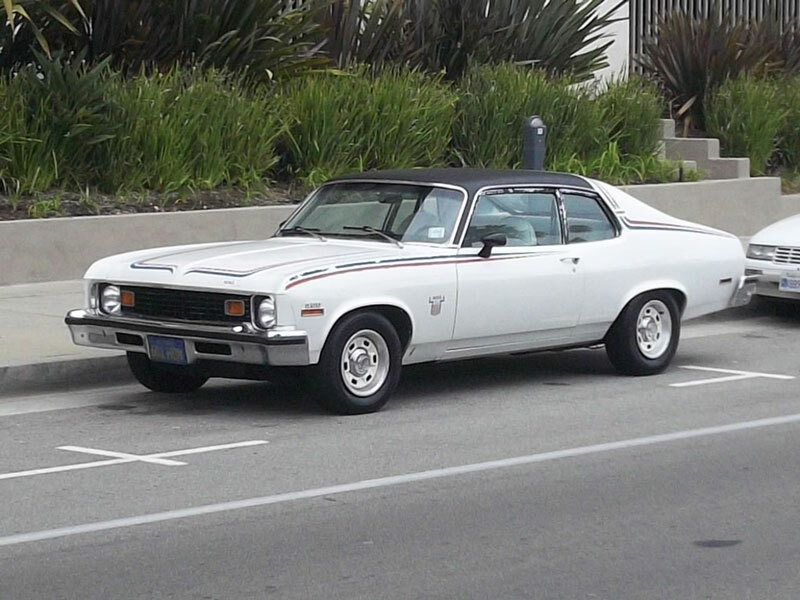 @MikePDX: I had the Pontiac Ventura version of this (’74 or ’75)–i.e., the hatchback, not the red-white-blue package. Yes, it was surprisingly cavernous, with fold-down rear seat, but the damn bathtub-sized weatherstrip leaked; I had to keep a couple of disposable aluminum trays (otherwise suitable for roasting a turkey) underneath the lower corners to catch the rain leaks. That said, it got me where I was going, and hauled my stuff, and paid off OK when I finally parted it out. I remember the guy who finally gave me $125 to drive off with what was remaining (minus hood, doors, hatch and exhaust)–ah, sweet nostalgia! If you think a surf car in Colorado is ironic, try this one. A hang 10 I found in Stockholm, Sweden in the summer of 2012. According to the regestry it’s model 1975 and it was first registerd in Sweden in 1975-03-27. It has 5 prewious owners (inkluding dealers) and is not registerd as a private import (i.e. it’s imported by the official agent) but the system has changed since then so it might be anyway. My 1971 Camaro came to Sweden in the 80-ies and is definitly a private import but the registry sais it’s not. My mom had a ’74 Nova Custom hatchback. Bought it in October ’74 for $3100. Only option it had was AM radio, was a base V6. Took that car everywhere, it was indestructible. We’d put the back seat down and it had plenty of room for me to sleep during long drives. The rear windows actually rolled down about 3/4 of the way. No A/C, but had vent pulls under the dash that would bring in fresh outside air that cooled you pretty quick. The only problem I recall with it was a failed shock which happened driving through the Poconos. She sold that car for a pretty decent amount of $$ in ’82 to a guiy who I’m pretty sure modded the hell out of it. I’m sure the V6 was the first thing to go. Would love to have that car back. One funny memory- the car had a warning buzzer with a sensor in the seat to fasten your seat belt. A guy at the dealer told my mom it could be disconnected. Mom handed him a $10 and it was quickly taken care of. I think you mean “straight six” . . . . as Chevys had only the 250-I6. GM would buy back the Buick V-6 (owned and tooling stored by AMC who obtained it when they purchased Kaiser Jeep) in 1974 . . . . but wouldn’t show up until 1975 MY. Interesting true story: GM’s Ed Cole went along with two other top GM engineers and an attorney, driving to AMC’s Detroit Headquarters in a GM engineering ’73 Buick Apollo with a refurbished/rebuilt ’60’s 225 Buick V-6 (this was an engineering test mule as the Apollo only had the Chevy 250 I6 or the Buick 2-bbl/4-bbl V-8s then). AMC had properly stored all the V-6 tooling as it preferred to use their in-line 232 and 258 sixes. This trip/purchase happened sometime in early 1973 as the V-6 was needed (a compact engine) that would fit in the engine bay of the Starfire/Skyhawk . . . . (engine bays were designed for the Vega Four or the stillborn GM wankel). I worked in the service department of a Chevrolet dealership in 1974 and I never saw a “Spirit of America” El Camino and I know of no dealer program to “create” one. That doesn’t mean that it wasn’t done somewhere, I just know the large volume dealership where I worked was not involved in such a program. The “Spirit of America” models in dark blue (Impala) didn’t look half bad in my estimate but the white ones were far more common and I didn’t care for them. I believe that blue was not availablle for the Nova or Vega. A local dirt track here [Santa Fe Speedway] had a ‘Sportsman’ stock car class with mostly modified 68-74 Novas in the early 80’s. One racer had a modded SOA,still carrying the stickers with roll cage, big tires, etc. It won some races and stood out in sea of rattle can painted dirt track cars. I like when either dirt track or drag racers keep the stock paint jobs. 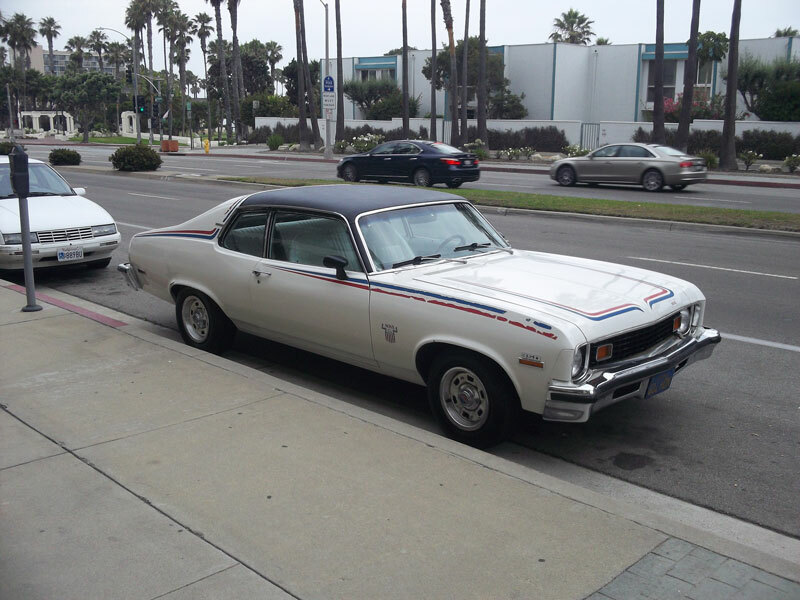 High school acquaintance/buddy had a ’74 Nova Spirit of America (San Rafael) in the day. His was a little special; a four-speed, 350 LM-1 four-barrel that had come from Pennsylvania, obtained when it was a year old. Had lots of fun cruising around in that car. I remember seeing a couple of Impalas in the day; more than a few the Vegas. I also remember seeing in the flesh quite a few ’72 Pintos with the “sprint” graphics; never saw a Mustang Sprint in person, nor the Hang 10 Dart Sport . . . . I own a 1974 SOA El Camino. White with blue carpet, white seat, etc.. I am 100% sure this is an original that originated in Shreveport, LA. I am in process of restoring it, but can not find decal kit for it… any help out there?? My sister had a 1975 Dodge Dart 1976 Montreal Olympic edition. I have not managed to find any info or pics of one online, but it looks like it was just a variation on the Hang 10 with Olympic Ring nameplates and decals. Has anyone else ever seen one? You bring up something that I’ve always wondered about at the time…were Ford’s SPIRIT and Chevy’s SPIRIT OF AMERICA series competing with one another or was it a prequel tie-in to the big BUYcentenial of 1976?? If you were around at the time you doubtlessly remember the THOUSANDS of bicentenial editions and tie-ins of everything. I mean I’m talking about everything. Food, appliances, cars, bikes, clothing, you name it there was a Bicentenial edition of it. That’s why I’ve always referred to it as the BUYcentenial!! 1974 SOAs were made to promote patriotism because Toyota was coming to USA in 1974. It appears to have ’73 bumpers on it, they look to be flat on top. Top of ’74 bumpers canted up at about a 25 degree or so angle, at least the ones I used to see. Don’t know, maybe there was some over lap at the model change times. Took my Spirit of America off the showroom floor back in May, 1974. While reading you comments concerning the vehicle you spotted in California, my Nova had black seatbelts. I have seen other cars that had red seat belts. I guess it all depended on where the cars were assembled. That Nova sticker that’s on the front hood, is not original. The first car I got 40 years ago was trimmed in red and blue. Recently, I purchased my second SOA Nova and had it totally repainted and restriped with a factory kit. The new decals also placed on the front hood, were red and blue. The two holes on either side of that front hood sticker lead me to believe that another size plate was first placed there. Were you able to notice if the back hatch area had red carpet? Because of the large area where the sun hits the carpet area, the red color would fade rather quickly if the car wasn’t parked under a covering. The steering wheel must have been replaced as well. Both of my SOA’s, although 40 years old, still had the red, white and blue striping visible. The hubcaps will indeed fade over time, as you pointed out. The car, you displayed, has been taken care of respectfully, ignoring the striping crumbling and peeling off. My observation is that this particular vehicle wasn’t originally a SOA. Last comment: Chevrolet only turned out the SOA style in 1974 for Nova, Vega and Impala. Some dealers took the idea and had their shops repaint and stripe El Caminos to add to the collection. While the outside looked like the other cars mentioned, the interior wasn’t detailed and stood out that this was a dealer reproduction. The shifter is wrong. the 1974 Shifter was a knob with a two finger grab that pulled up. Great looking car, the “Spirit of America” edition is very nice. I myself have the Impala and I can’t say enough how pleased I am with it. It has the beautiful white leather seats, white exterior, and blue carpet inside. I haven’t done anything to it and my understanding is, that it’s still all original. I do have some rust that will need to be fixed soon. Anyway, thanks for the share, I don’t think these cars get enough attention. Im curious DianaR209, your Impala has leather seats? That would have to be a special order item as even the Caprice had a combo of vinyl and or cloth interiors. Either way thats a beautiful car!! Unfortunately, I had to sell it due to health crisis, The man that now owns it will be taking very good care of it. I own an original 74 SOA. My grandparents bought it for my dad for his HS graduation. I remember riding in the back as a boy. My Dad traded it back to them for a 72 gran torino. My grandfather drove it until 1992. I was given the car in 1998 to restore. I have never driven the car, but the restoration didn’t begin until 2016. I now have a car with a running engine, rebuilt the original 3 speed,and buttoning up the rest. I will put almost everything back to original, with only the exception of the 250 6 banger , now replaced with a 454 .70 over (470) inch monster. Hello all. I have one of thse baby’s. Well, i bought it for my wife, and let me say, she absolutely loved / loves it. The story goes; back in 2007, unfortunately, our house burned down to the ground. Yep, 3 am, on 1-17-2007, my son awoke me with ” Dad, the basement is on fire.” Needless to say, we lost everything,” but, WE, made it. That is the important part. Wood and stone can be replaced, but our family cannot. Luckily, we had good insurance. Wih a little money leftover, and after situated in our new house, i walked into the local shamokin,pa puff’s yobacco store. In the corner window, as you were exiing, was an ad for a 74 chvy nova $5000 obo. I called, went and checked it out. Wow. The elderly woman, told me her son had bought it from an older farmer, where it had sitten for awhile in his barn, and i guess had belonged to his son. Anyhow, he brought it home, cleaned it up, and only had driven it to prom. After that point, he had joined the service and instructed his mom to sell it. Well, i got it for 4000.00 wth only haring it run. Got her home, very very nice. Put it right in the shop to have it looked over. Had engine pulld, bored .60 over. Installed flat top alluminum pistons, bearings, the works.Cammed, valved, ported. Radiator sprung a leak and ran her and pushed her home hot one night. Been sitting in my garage ever since. Mice have moovd in. Destroyed any typpe of paperwork in the glove box, but hopefully nothng else. Cats have scratched up the vinyl top, to where it needs replaced. Hopefully soon, i will find a reputable garage in my area to fix her. I do call around from time to time, but nobody wants to work on the older cars anymore. I will never ever sell her, my wife loves it too much. Well, thats just my nova story. I was blessed to own a 72 Nova that I bought from my brother- in-law(he bought it new) not as pretty but it was fast. It had 350 in it. Then I bought the Spirit of America Nova slightly used in 76- I had air shocks, craiger Mags and 70’s on the back- it also had 350. That was the vehicle of choice for our honeymoon in 1977. 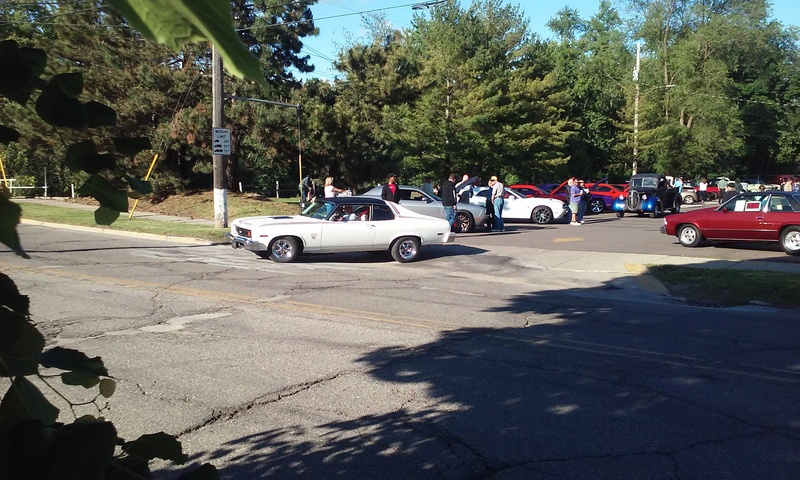 I also owned a 72 Gran Torino at the time of our marriage and an old Plymouth Fury. Sure miss them especially the Novas! Someday I will own another one! I was 19 when I purchased the Spirit of America- don’t have the cars but still have my sweet wife of nearly 41 years! I saw one of these last month leaving a local cruise. Didn’t get good shots as they were pulling out just as I arrived. My folks used to live in Redondo Beach, on Catalina Ave. Dad wanted to buy a place in the area, my mom said “let’s rent a place for a year and see how we like it.” They liked it just fine- but the damp California winter fog and mom’s arthritis didn’t get along so well. Mission Viejo wound up being their permanent home. The ’74 Nova Spirit of America- the car I should’ve bought that year! Everyone have a great 4th. Another vote for this being a clone — two things strongly point to it being a 1973 model, and not a ’74. It definitely has the front bumper from a ’73 Nova, and the giveaway is that it’s titled as a ’73 model in the CA smog database. It does seem a bit odd that someone would go to such an effort to make it appear like the real thing, though. I recall they offered some sort of tent option that you could rig up using the hatchback in ‘73 or ‘74. 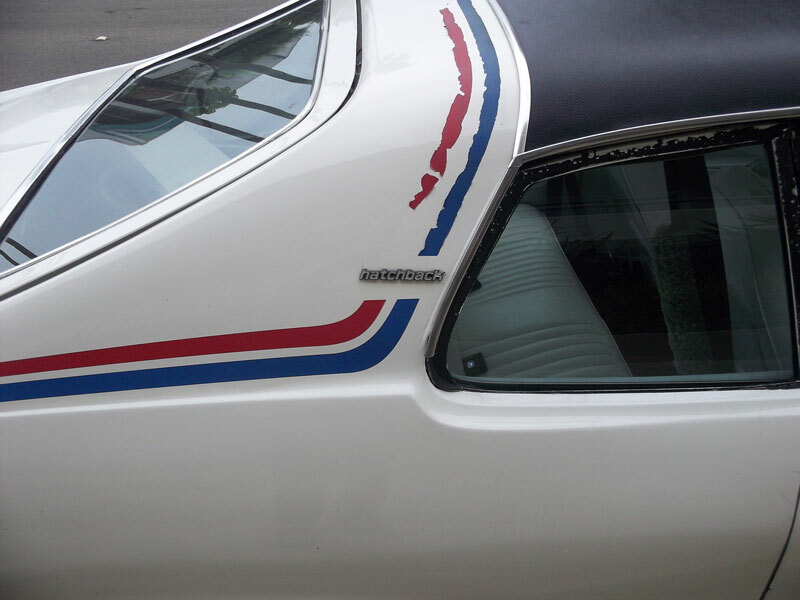 Even the 1974 Pontiac GTO had a patriotic theme on offer. This one was also a lift back. The steering wheel does not have RWB stripes, the door panel trim pull is wood grain not RWB. The seat rib stitching is not the seats found in the SOA. 1Y17H4L###### from Van Nuys,CA plant. The badges are not exactly perfect position. I’ll bet the fire wall under the hood is stand blue. If any one is interested in seeing a real one it’s in Long Beach, CA near Market St at a transmission shop. He was the only person worthy that I would sell it to, to take good care of it. It’s probably In a plywood box, lol. It still has the original dealer window sticker in the glovebox.